QB Aaron Rodgers $6,000 vs. ATL – While Aaron Rodgers has shown public supported for fired HC Mike McCarthy, the reality is he probably wanted to see him go. The Packers are coming off an embarrassing home loss to the Cardinals, yet are favored by 6 points against a far more capable Falcons team this week. This is an appealing game with shootout potential as long as the weather is reasonable in Green Bay, since both secondaries are banged up and both QBs are elite. Atlanta ranks 31st in DVOA pass defense and Rodgers has been gold at Lambeau Field throughout his career. His price tag is down due to poor recent results but a coaching change could fix what ails this offense. QB Baker Mayfield $5,800 vs. CAR – His actual perfromance left a lot to be desired, but Baker Mayfield threw for 397 yards to come up a hair short of 20 DK points in a third straight outing. He draws a much better matchup this Sunday against a Panthers team that’s allowed multiple TD passes in 10 of their last 11 games. Ron Rivera is taking over as defensive play-caller and that could create a gap in communication initially. Cam Newton is set to burn the Browns defense in a bounce-back effort, as top CB Denzel Ward could be inactive. Either way, the Panthers defense is far more vulnerable to passing attacks so Mayfield’s volume is ensured. RB Mark Ingram $5,700 @ TB – After consecutive quiet outings, Mark Ingram is bound to have light ownership this week. He continues to split touches rather evenly with Alvin Kamara and is markedly cheaper ahead of a road tilt at Tampa, a team that simply can’t stop the run. The Bucs rank 30th in DVOA rush defense and have been pulverized in three straight weeks by Saquon Barkley, Matt Breida, and Christian McCaffrey. Ingram is capable of piling up TDs if game flow works in the Saints favor and that could make him a better value than Kamara with similar red zone usage. RB Jeffrey Wilson Jr. $3,800 vs. DEN – The 49ers are finally giving Matt Breida a chance to rest his ailing ankle and have ruled him out of Sunday’s home tilt with the Broncos. While Denver’s been better lately against the run, that is where they’re primarily vulnerable and an injury to elite DE Derek Wolfe (ribs) won’t help. Jeff Wilson produced 134 yards on 23 touches in a loss at Seattle last week and his usage in the passing game (9 targets) is especially encouraging. He’s a dirt cheap option that can help you afford studs at WR on a site that values that position more. 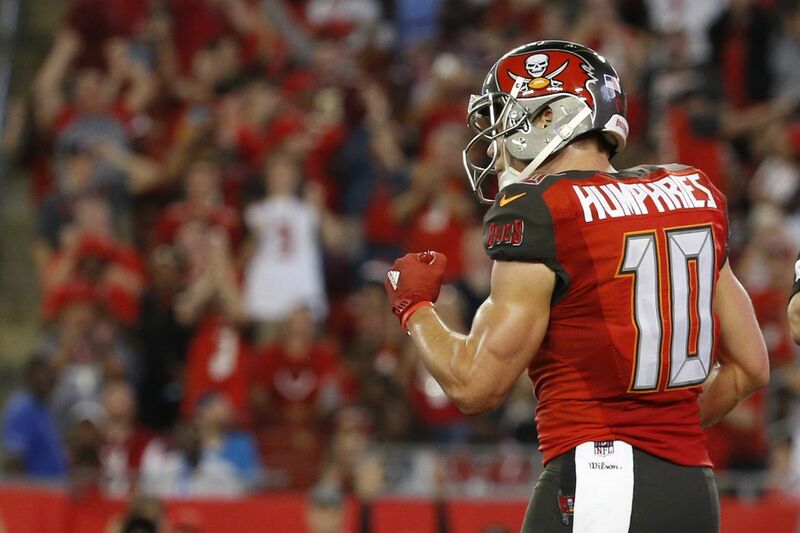 WR Adam Humphries $4,900 vs. NO – After paying off in this spot last week, Adam Humphries comes highly recommended in an even better matchup this Sunday. New Orleans is great against the run and opposing TEs, but truly awful against interior receivers with P.J. Williams struggling at slot corner. Humphries caught seven of a team-high nine targets for 61 yards and a TD last Sunday and could see even more volume given the Saints’ ability to open huge leads. Jameis Winston is playing at a high level and is able to find his slot man more often after buying time. WR Mike Williams $3,900 @ CIN – The Chargers passing offense consisted of Keenan Allen, who drew a ridiculous 19 targets, and receiving back Austin Ekeler during a comeback win at Pittsburgh last Sunday. Both should be very popular plays this week against Cincy’s swiss cheese defense, so Mike Williams is more of a contrarian option despite his modest price tag. Williams caught all three of his targets for 52 yards in a tough matchup and will have an easier individual draw since the Bengals are far more vulnerable on the perimeter. Cincy ranks 29th in DVOA pass defense against No. 2 receivers and is above average against slot WRs, so perhaps Allen disappoints while Philip Rivers stays hot by feeding his big red zone target. TE Jimmy Graham $4,400 vs. ATL – The obvious pairing with Aaron Rodgers is WR Davante Adams, but you can double down on a Packers stack with Jimmy Graham. He’s effectively become the No. 2 receiver with the rest of that group struggling badly. Despite the fact he’s dealing with a broken thumb, Graham caught 8-of-11 targets for 50 yards in a low-scoring bout with Arizona and could thrive against a Falcons team that ranks 28th in DVOA pass defense against opposing TEs. Atlanta loves to force throws underneath and try to make tackles, so Graham could have a productive day in terms of short catches and YAC. FLEX Jaylen Samuels $3,700 @ OAK – With James Conner (ankle) ruled out, Jaylen Samuels becomes a virtual must play at this price tag. Steelers HC Mike Tomlin was talking him up a few weeks ago and will now give him the keys to the backfield with injury-diminished Stevan Ridley changing the pace. The Raiders are obviously a doormat, as they’ve allowed the most rushing yards (1,515) to opposing RBs this season. Pittsburgh’s offensive line is one of the best in football and Conner has repeatedly proven that any capable runner can produce huge lines behind that unit. D/ST NYG $2,400 @ BUF – The Jets were able to remain competitive in a tough matchup at Tennessee last Sunday because of their defense. Their secondary is routintely winning matchups and will have little trouble containing a Bills receiving corps that is rather toothless. Josh Allen is taking of to run more often than not, which could lead to a fumble or injury, forcing ancient backup Derek Anderson into action. With a 38-point Over/Under, this game is ripe to target with either D/ST, but the Jets defense is far cheaper than that of the Bills.